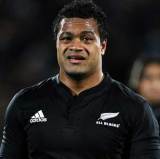 Tongan-born Sione Lauaki made his international debut for New Zealand against Fiji in 2005, having represented the Pacific Islanders in three of their Tests in 2004. Graduating from the same club side as the great Michael Jones, Lauaki was selected for the All Blacks after scoring tries against Australia, South Africa and New Zealand for the Pacific Islanders. In 2005 he made substitute appearances in the first and second Tests against the British and Irish Lions before starting the third Test in Auckland as the All Blacks racked up a series whitwash. He made four appearances for the All Blacks during the 2007 Rugby World Cup, starting against Romania and Portugal. He played his club rugby in New Zealand for Waikato and the Chiefs, joining Top 14 side Clermont Auvergne in 2010 following a series of disciplinary breaches at home. After one season with Les Jaunards he moved to Bayonne, where he was joined by fellow All Black Neemia Tialata in a double swoop.